Redefine your commercial space by adding motorised blinds that work seamlessly and effortlessly. With a touch of a button, you can control the amount of sunlight entering your office or facility. Setting the mood and ambience is easy with automatic blind systems from Kensington. We design our automated window treatment solutions according to the varying needs of our clients. That means you will get bespoke electric window blinds for your commercial property. There is no need to run around the office to close and open the blinds: the automated system will do it for you. These products are ideal for a variety of commercial applications. Just press the button and you can create the ideal working environment. Our automatic window blinds are the perfect addition to a revamped office or a new establishment. They make your space look more professional and your employees and guests will appreciate how the automated blinds add to the comfort and convenience of the building. With Kensington, comfort and convenience are truly at your fingertips. We use high-quality motors to control your blind system. This ensures optimum performance and satisfaction for you. Our qualified personnel will install your automatic window blinds professionally to avoid any problem. If your system fails, the after-sales service you need is just a phone call away. Our motorised blind systems give you full control over your establishment’s energy efficiency and automation requirements. Motorisation is ideal for different types of window treatment solutions, including venetian blinds, vertical blinds, rooflight systems and shutters. By allowing Kensington to install automated blinds in your building, you can reduce energy consumption and improve your window insulation. 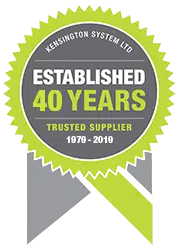 The only company you have to call for your shading and installation needs is Kensington. Contact our team today to learn more about our products and services.